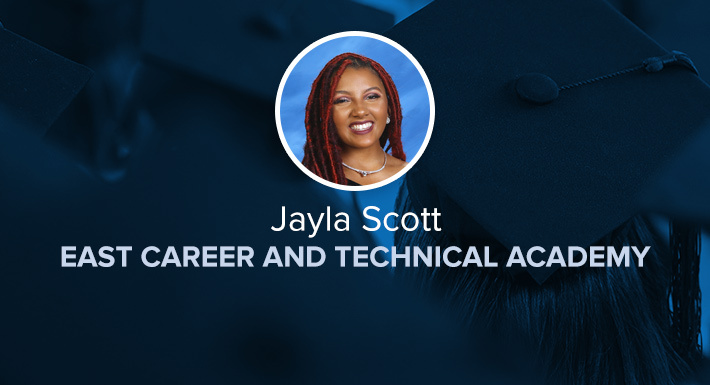 East Career and Technical Academy Star Graduate Jayla Scott has seen it all. She has fought through housing and food insecurity, time in foster care, an unstable family life and so much more. But look at her now: She is a powerhouse of positivity and strength. She is generous and energetic, and she never stops. Because she has not always had it easy, she has a heart for those who struggle. And wow, is she accomplished. She is in the top of her graduating class, has served over 500 hours as a skilled volunteer at Sunrise Hospital, has revitalized East Tech’s Black Student Union and is a HOSA (a national student organization for health education and biomedical sciences) award winner. Jayla has been accepted to schools across the country, and is likely going to turn down a full ride to Stanford University so she can accept a full ride to Johns Hopkins University in Baltimore. She has a passion for helping others, and will continue to do amazing things for all those around her. Jayla will change the world. She is a force, and she will not stop until she has made the world a better place. Her Titan family is so very proud of this Star Graduate, and we cannot wait to see what she does next!